The IOWMCC is the Isle of Wight Motorcycle club. We are affilated with the ACU and all our events are run under their sporting code. 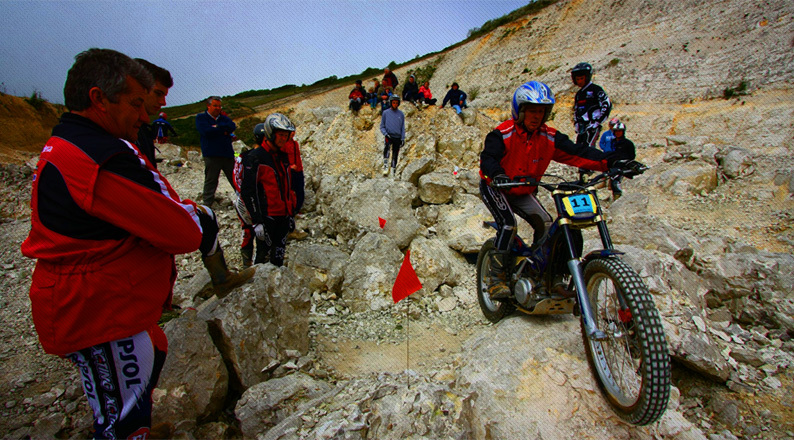 We are based on the Isle of Wight in the South of England and are a trials only club aiming to run regular events. We are a friendly, local club and run for the benefit of the members and local trials. We run a Summer Championship and a Winter Championship. We also host an annual open two day trial in April, and have also run Youth and Ladies' national trials. A shot of the action from the 2010 two-day trial. Image credit: Alexis Russell. We encourage Youth and Novice riders by providing suitable routes for all abilities, from Youth D through to Expert. We also run an 'E' route for beginners. Spectators are always welcome and we are grateful for people getting involved and helping out with observing the sections, administrative jobs and clearing up at the end of the day. We are lucky on the Island to have available to the club a large variety of venues, with very obliging landowners, which we very much appreciate. If anybody has any land they think may be suitable then get in contact with us and we'll come and have a look, as new venues are always appreciated. If you would like to become a member or would like further information please feel free to get in touch. Alternatively, give Nick Symes a call on 07740 368 626. You also can contact the club secretary Rachael Brodie on: 01983 523 264. Club membership costs £10 per year for seniors, and £5 per year for juniors. Members must hold a valid ACU trials license, which costs £10 per year. The cost of each trial is £10, but this fee can be waived if you provide an observer. All of our trials take place on the Isle of Wight. If you are visiting, Wightlink and Red Funnel operate car ferries from Portsmouth, Southampton and Lymington. Detailed location information for each trial can be found in the events section.